As functional as it is visually striking, a great children’s armoire can completely transform your child’s bedroom. 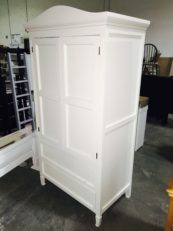 We’re pleased to provide the best selection of armoires for kids in Los Angeles, including a wide variety of styles to ideally suit your space. Choose from an array of beautiful colors, reputable brands, and diverse styles to find the perfect fit. Each distinctive children’s armoire in our collection reflects our unrivaled commitment to the highest quality in both design and appearance. We offer an array of different styles, including options with open front cabinets, mirrored doors, different drawer designs, and much more. Our furniture is crafted of solid natural wood, making it the perfect choice for reliable, long-term use. Our entire collection is crafted to reflect the standards we set for high quality design and unparalleled safety. Whether you’re shopping for a toddler, a teen, or anyone in between, you’re certain to find the perfect piece in our selection of the best armoires for kids in Los Angeles. To find the children’s armoire you’re looking for, we invite you to visit one of our Los Angeles showrooms. You can also contact us for a custom furniture consultation or to answer any questions you might have.